The force-type connection between the strain sensor and the machine component varies slightly from one sensor mounting to another. As a result, the zero point and the span from installation to installation is minimal different. For this reason, it is important to adjust the zero offset after mounting the strain sensors. 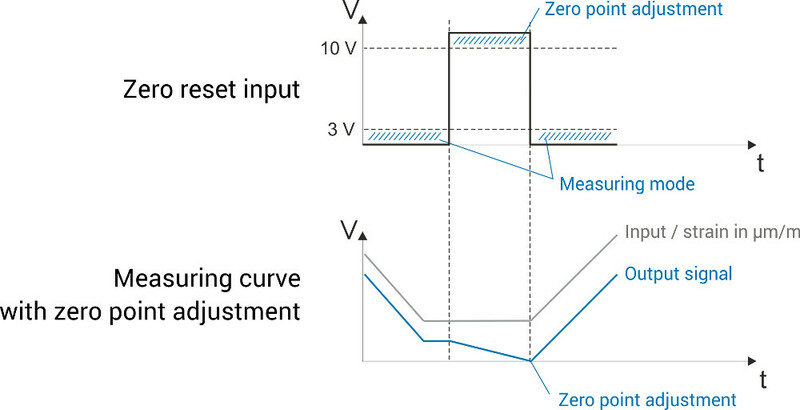 Depending on the application, there are different strategies for taring the zero point offset. The different options at X-Sensors for zero point adjustment are described below depending on static and dynamic applications. Dynamic applications describe recurring, fast measurement cycles, as usually found in presses. In cyclic applications, it is important that the zero point is tared in regular intervals in order to minimize drifting of the measuring signal due to temperature effects. For zero point adjustments in cyclic applications, X-Sensors offers two different tarings options. For both, a reset input is available on the sensor, which can be conveniently triggered by the PLC. Because the zero point adjustment in dynamic applications occurs periodically at the “zero point” of a machine, it is called Process-Zero. The Process-Zero can be triggered by the PLC via a sensor input. If the input is pulled to >10 V, the signal is set to zero (reset) and the zero point adjustment is carried out. If the input is open or 0V, the sensor is in measuring mode. The reset logic is alternatively available with Active-High-Levels instead of Active-Low-Levels. The zero-point adjustment at these strain sensors is carried out by a digital zero-point adjustment mechanism. The zero-point adjustment is stored within the sensor. Thus, a non-volatile, stable zero-point adjustment is available regardless of the cycle times. The time span between the taring procedures can be freely selected without any limitation. It should be noted that the zero point is not stored in the event of a power failure. This zero point adjustment is suitable for all dynamic applications. They can be universally used in all applications which require a periodic zero-point reset. Static measurements describe slow force changes, such as they occurre at the monitoring of structures, installations or in the weight measurement of silos. In contrast to dynamic applications, this zero point adjustment only has to be performed once after installation. Therefore, this type of zero point adjustment is called Installation-Zero. Thanks to a sensor input, the Installation-Zero can be easily teached-in by the PLC. If the input is pulled to >10 V, the signal is set to zero (reset) and the zero point adjustment is carried out. If the input is open or 0V, the sensor is in measuring mode. The reset logic is alternatively available with Active-High-Levels instead of Active-Low-Levels. Thanks to the digital input, the zero point adjustment can be easily teached-in by the PLC, even though the strain sensor is mounted at a place difficult to reach. The zero point adjustment at these strain sensors is carried out by a digital zero point adjustment mechanism. The zero point adjustment is stored permanently, it is not lost after a power off. It provides a non-volatile, stable zero point. Therefore, it is qualified for all static applications. The numbers of tarings is limited to 100.000. Strain sensors without integrated zero point adjustment are suitable for static and dynamic applications. Sie möchten mehr Informationen zu den Nullpunkt-Tarierungsmöglichkeiten? Senden Sie uns eine Nachricht!